LSI First. Range Chemistry Second. You are here: Home / Blog / LSI First. Range Chemistry Second. What if Range Chemistry is the wrong thing to focus on? In recreational water, range chemistry refers to the textbook ranges for water chemistry. For example, "pH should be between 7.2 - 7.8, and ideally 7.4 - 7.6." The ranges apply primarily to sanitizer levels, pH, total alkalinity and calcium hardness. There are also maximums (TDS, for example) and minimums (like ORP). If we focus on just those ranges, we are managing water chemistry 'by the book', right? But what if range chemistry is the wrong thing to focus on? Let's ask the question another way: what is the most unstable chemistry in water? What changes most frequently? The answer is pH, and pH is very important because it affects virtually all other chemistries in water. pH is especially important in chlorine pools, as it dictates the strength of chlorine via Hydrogen dissociation potential. Here's a chart to remind you. The pH determines the the strength of chlorine. Why? Because the Hydrogen in HOCl (the strong, killing form of chlorine) dissociates more and more as the pH rises. This dissociation happens on an equilibrium determined by the pH. 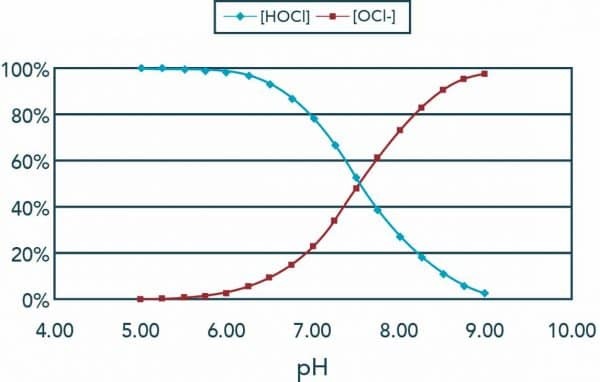 If your pH is 7.5, it's about 50/50 balanced between HOCl and the weaker form of chlorine, OCl-. Unfortunately, that same concept of dissociation is part of what makes pH so hard to manage. It's constantly fluctuating in swimming pools; if we are aiming to keep the pH "in range", we are aiming at a moving target. It's frustrating, to say the least. And yet, it is common practice in the pool business to juggle acid, bicarb, CO2 and soda ash to attempt to control pH. If you're chasing pH, we think you are chasing the wrong thing. Instead, focus on the overall balance of your water, according to the Langelier Saturation Index (LSI). Play around with the Orenda App. Watch how each individual factor impacts the LSI. Water Temperature: personal preference with a maximum of 104ºF. TDS: maximum of 1500 ppm over start-up levels. CYA: 10 - 100 ppm, ideal range 30-50 ppm. Do you measure these factors on your pools? If so, how often? They are important factors in the LSI that are very commonly neglected. Play around with our dosing calculator, one factor at a time, and watch the impact they each have on the LSI. You may be startled. Neglecting half of the LSI only hurts you, your business, and your customers. 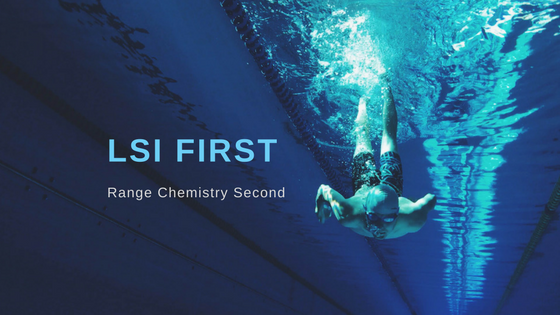 Again, LSI first, range chemistry second. If you factor in all 6 components of the LSI, you may discover ways to simplify your job as a pool operator. For example, the calculator teaches us the value of calcium hardness. It buffers your LSI, and it doesn't fluctuate easily! It is the rock to build your water chemistry castle on. When we change our mindset from chasing a moving target (pH), and instead focus on balancing the LSI, the value of calcium becomes undeniable. Calcium may not buffer the pH directly, but it certainly buffers the overall LSI. Wouldn't it be nice to have a foundation of calcium that gets you closer to equilibrium? What could that do for your water? How could that help your bottom line? Imagine how much less you would need to spend on sodium bicarb, soda ash and acid if your calcium level gets you close to LSI balance? You would be making micro-adjustments to your water chemistry...not major ones. The Orenda App calculator taught us this revelation. Let's take a step back from the chemistry classroom real quick, and put all this message into the real world. We at Orenda have made teaching the LSI a cornerstone of our company's mission. Why? Because it's real. It does matter. For too long, we in this industry have been taught behaviors and habits that work for range chemistry management, but ignore other factors of the LSI. Sure, the quality handbooks in the pool business discuss the LSI and its importance...but let's be real! It's a tough equation that most people will not do in the field. The economics of managing swimming pools simply do not allow for extended pool visits involving higher math. That's why we have so heavily invested in our mobile app's LSI calculator. It is a tool so you can calculate the LSI very quickly and easily. AND it tells you how to correct it on your own terms. We recommend looking at higher levels of calcium hardness in your water so you can see an alternative way of managing your chemistry. See if it works for you. You may find you're spending a lot less money chasing a moving target, and a lot more peace of mind knowing you are protecting your customer's pool and equipment from corrosion.